Compressed air is used in industries for various applications in pneumatic tools, pneumatic instruments, pneumatic machines and in a variety of production processes. The consequences of using wet air are rust and scale deposits in steel pipes, increased resistance in flow, malfunctioning of process control instruments, corrosion and damage to electromagnetic valves and pneumatic system, peeling and blistering effect on spray painted surface etc. Thus it will affect the quality of product and lead to excessive maintenance cost. Air from the compressor has excessive moisture and contaminants. The sketch below shows a typical Compressed air system to remove these damaging impurities and get Clean and Dry air.When compressed to 7Kg/cm2g the temperature of discharge air reaches around 140oC. The after cooler and Separator installed after the compressor will cool the air, and removes 90% of moisture and oil. For instance, when the compressor takes in 100 NM3/hr of ambient air at 40oC and 50% relative humidity, at 7Kg/cm2g the after cooler will condense an average of 30 liters of water in 24 hours. If the outlet air temperature from the after cooler is 40oC, it still contains 8000 ppm moisture. At 45o C compressed air contains 10,500 ppm, at 50oC, 13,500 ppm moisture which is removed by Air Dryer. Therefore, lower the temperature of air at dryer inlet, smaller would be the size of Air Drying Unit. If compressed air temperature is higher than 400C, it is essential to precool it to 400C temperature before Air dryer. This cooling is achieved in a shell & tube type heat exchanger using cooling water. Due to this cooling some moisture condenses out which then helps in keeping the moisture load low on Air dryer and thus better Dew-point of air. "Dew point is the measure of moisture in Air. It is the temperature at which moisture present in the Air, starts condensing. Lower the Dew Point, more dry is the Air”. Air of (-) 400C Dew point means no moisture would condense unless the temperature of the compressed air goes below (-) 400C. For most industrial applications Dew point of around (-) 100C is satisfactory. However, as a common industrial practice, most of Air dryers are rated for (-) 400C Dew point. Lower the Dew point, higher would be the operating cost. Hence, proper selection of Dew point is very important for economical operation. 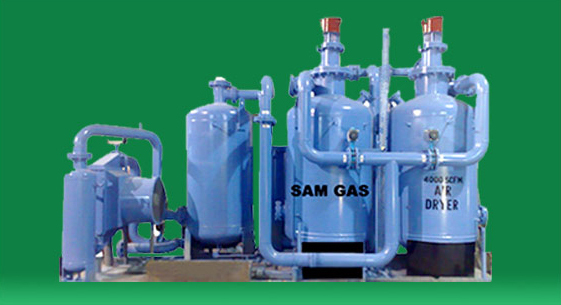 Oil present in Compressed air is detrimental to the desiccant of Air Dyer. If not removed, it gets coated on the desiccant and reduces moisture adsorption capacity resulting in frequent replacement of desiccant.Therefore if your compressor is oil lubricated type, an oil filter before the air dryer is essential. This oil filter has Activated Carbon which removes oil from the air completely and thus enhances life of desiccant. 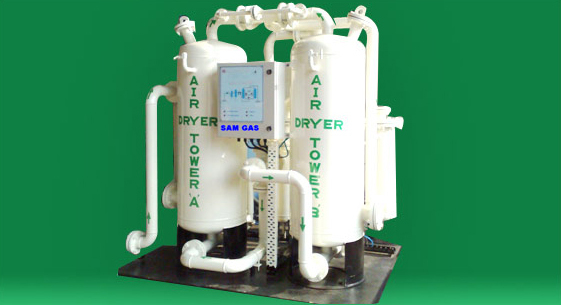 This is the simplest type of Air Dryer with Activated Alumina / Molecular sieves Drying agent. Investment wise also this is the cheapest. This design is virtually maintenance free, fully automatic, and requires no attention for years. Heatless type dryers do not require any heating for re-generation and therefore are very simple in design and smooth in operation. Desiccant life is around 5- years. Power requirement is Single-Phase, 60 watts only.